It’s no secret that everyone loves a great deal – especially ones where you feel like you are getting real value for money, paying less for an item where quality is never sacrificed. 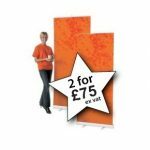 At Printdesigns we’re proud to offer a range of fantastic deals for all of our customers, giving them the chance to grab a fantastic display stand solution for the best price on the market. We are able to treat our customers to these low cost solutions thanks to our in-house printing process. With no extra middle men to consider, we can keep prices low and quality high across our entire range of exhibition stand and marketing products. The humble roller banner has become a staple solution for many of our clients, offering a quick, easy and reliable way to transform any exhibition stand space into a branded environment. At Printdesigns these solutions are even more affordable, available at a price of just £37.50 each when bought as part of our 2 for £75 offer. Roller banner stands always give great return on investment, and with this deal this can be leveraged at evert event you attend. At Printdesigns we love giving our customers access to the very latest innovations in display stand solutions. The range of TEXStyle fabric exhibition stands offer the very best in aesthetic appearance, portability and ease of use, making it perfect for any marketing team who wants to stay ahead of their competitors. 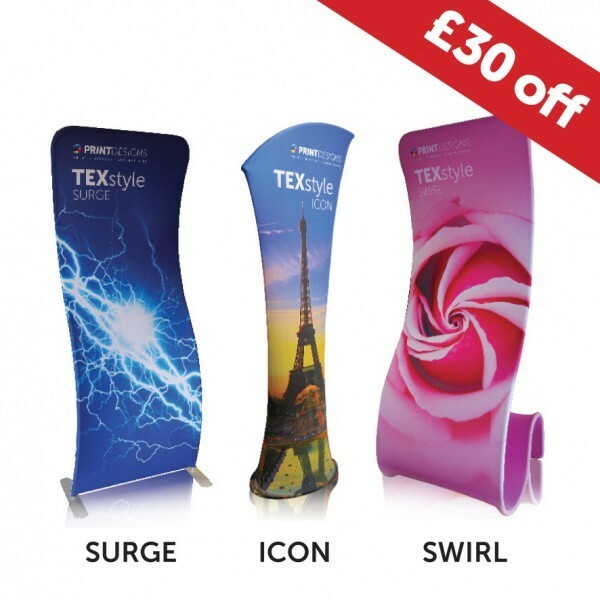 We’re offering £30 off each single TEXStyle banner stand, available while stocks last. For those who are looking for a complete exhibition stand solution, TEXStyle bundles are also available at a great price. Our rectangle and oval bundles, including a fabric backwall display stand and a counter in either rectangle or oval shape can are available at just £550 each, saving £100 and £50 respectively off their RRP. With either one of these bundles, you will have everything you need for each exhibition you attend for weeks, months or years to come. These are just three of the many fantastic deals we have available online, with discounts on our 3×3 cross braced pop up stand kit, our 3×3 express pop up stand kit and our 3×3 impact complete pop up kit also offered to our customers. 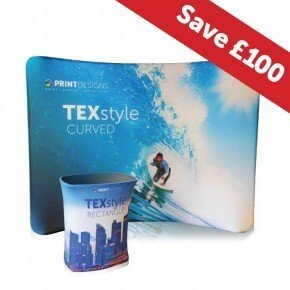 To learn more about these deals or any other of our display stand solutions, get in touch with a printing expert online.